To understand what a Mechanical Keyboard is, let’s review how the majority of keyboards are set up. A typical cheap rubber-dome keyboard. Most keyboards today use either rubber-dome or scissor-switch mechanisms. 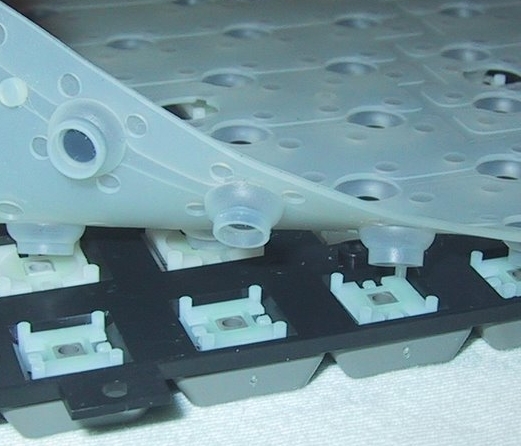 The rubber-dome type is found in all OEM keyboards. Computer manufacturers typically include rubber-dome keyboards because it’s cost effective, and easy to make. The second type, scissor-switch, sounds deadly, but is found in most thin-profile keyboards and laptop keyboards. The name comes from the fact the keys have a switch made from inter-crossing plastic pieces. This is where Mechanical Keyboards make their powers clear. They are consistent, the keys will have uniform pressure to depress, and will come back at the same rate. They are tested for up to 50 million key-presses. They are better at handling debris and dirt affecting the key-switch mechanism. They provide a great tactile feedback, and sometimes even audible feedback, so you are sure the key is pressed, thus you can type more confidently and faster. Most Mechanical Keyboards in the US use Cherry Corp’s Cherry MX series switches. Each switch has a distinct color on it’s keystem. Blacks are non-tactile and use linear action, great for gamers. Reds are non-tactile and use linear action (like the Blacks), but require less downforce.